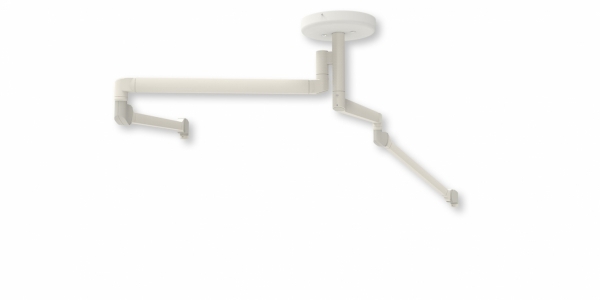 Ceiling pendants with compact spring balanced swivel arms have wide range of their usage: as holders of surgical luminaire, cameras, monitors, X-ray apparatus safety screens, and many others specialised devices. 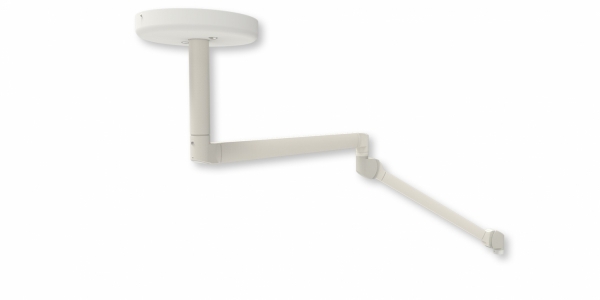 The wall mounted version can be used even for carrying the televisions in patient´s room. Ceiling pendants SPR 10-1 (SINGLE) is formed by one rotary arm which is vertically adjustable and has a maximum load capacity of 28 kg. It is thus for its load capacity designed to carry heavier loads. Pendants finds its use mainly in operating rooms, examination rooms, but also in patient rooms. Also due to its variability and the possibility of mounting different types of equipment. Pendants allows due to its unique technology to rotate a full 360 ° without restriction. Ceiling pendants SPR 10-2 (DUO) is composed of two rotary arms that are height adjustable and each of them has a maximum load capacity of 28 kg. It is thus for its load capacity designed to carry heavier loads. Pendants finds its use mainly in operating rooms, examination rooms, but also in patient rooms. Also due to its variability and the possibility of mounting different types of equipment. Pendants allows due to its unique technology to rotate a full 360 ° without restriction. Ceiling pendants SPR 10-3 (TRIO) is formed by three rotary arms that are height adjustable and each of them has a maximum load capacity of 28 kg. It is thus for its load capacity designed to carry heavier loads. Pendants finds its use mainly in operating rooms, examination rooms, but also in patient rooms. Also due to its variability and the possibility of mounting different types of equipment. Pendants allows due to its unique technology to rotate a full 360 ° without restriction. Ceiling pendants SPR10-4 (QUATRO) consists of four rotary arms that are height adjustable and each of them has a maximum load capacity of 28 kg. It is thus for its load capacity designed to carry heavier loads. Pendants finds its use mainly in operating rooms, examination rooms, but also in patient rooms. Also due to its variability and the possibility of mounting different types of equipment. Pendants allows due to its unique technology to rotate a full 360 ° without restriction. 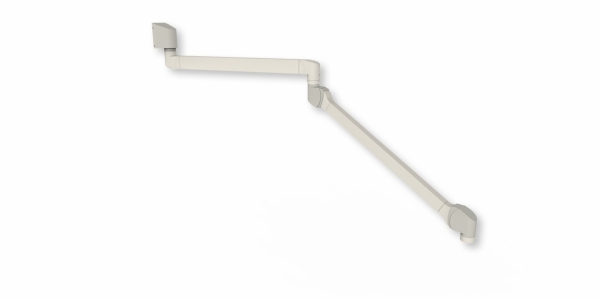 Pendant SPR 10-1W (SINGLE - W), which is adapted for installation on the wall is formed by one rotary arm which is vertically adjustable and has a maximum load capacity of 28 kg. It is thus for its load capacity designed to carry heavier loads. Pendant finds its application in particular examination rooms and patient rooms. It is also popular because of its flexibility and the possibility of mounting different types of equipment. Ceiling pendant SPR 11-1 (SINGLE) is smaller, lighter and softer variant SPR 10-1. The pendant is formed by one rotary arm which is vertically adjustable and has a maximum load capacity of 14 kg and is thus designed to carry lighter loads. Pendants finds its use mainly in operating rooms, examination rooms, but also in patient rooms. Also due to its variability and the possibility of mounting different types of equipment. Pendants allows due to its unique technology to rotate a full 360 ° without restriction. Ceiling pendant SPR 11-2 (SINGLE) is smaller, lighter and softer variant SPR 10-2. The pendent is formed by two rotary arms which are height adjustable and each of them has a maximum load capacity of 14 kg. It is thus designed to carry lighter loads. Pendants finds its use mainly in operating rooms, examination rooms, but also in patient rooms. Also due to its variability and the possibility of mounting different types of equipment. The lower rotary arm of pendants allows due to its unique technology to rotate a full 360 ° without restriction. 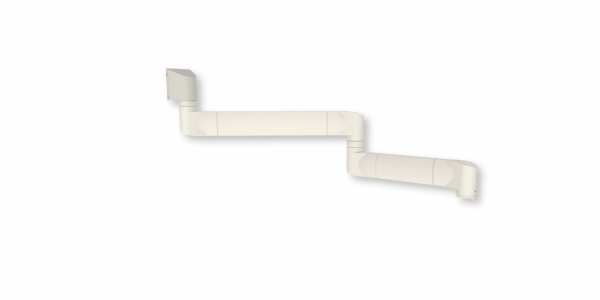 Pendant SPR 11-1W (SINGLE - W), which is adapted for installation on the wall is formed by one rotary arm which is vertically adjustable and has a maximum load capacity of 14 kg. It is thus designed to carry lighter loads. Pendant finds its application in particular examination rooms and patient rooms. It is also popular because of its flexibility and the possibility of mounting different types of equipment. 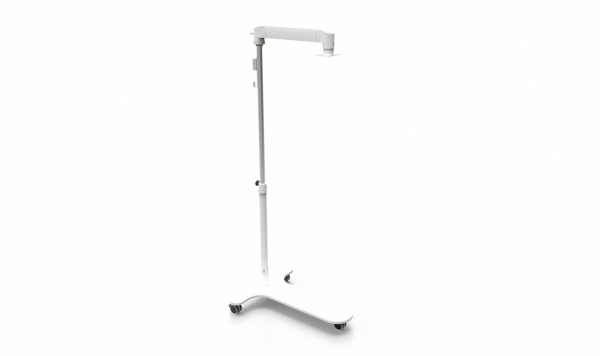 Mobile stand (SPZ 13) is movable carrier medical technology with a maximum weight of 5 kg. It consists of a chassis on wheels, telescopic rods with maximum extension of 550 mm and arm length of 480 mm. The device is used primarily as a carrier of heat emitters to the neonatology department of the medical facility.